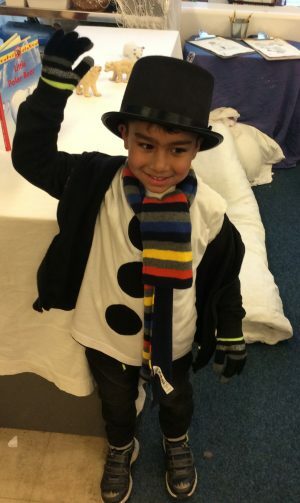 “World Day of the Snowman”. 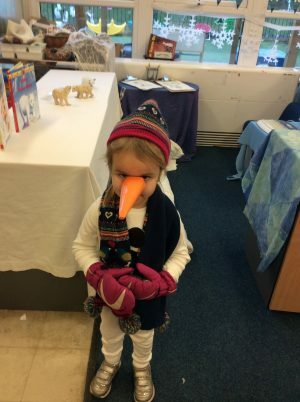 We found out that ‘the snowman’ is a symbol of Winter. 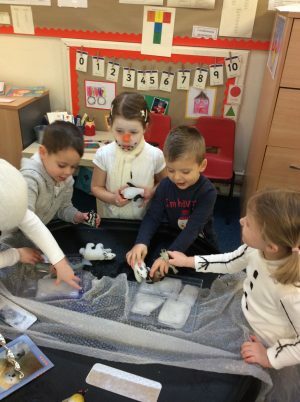 Our ‘Sparkle’ day in Reception and Nursery was a freezing mixture of glitter, glue, marshmallows, ice and scarves. 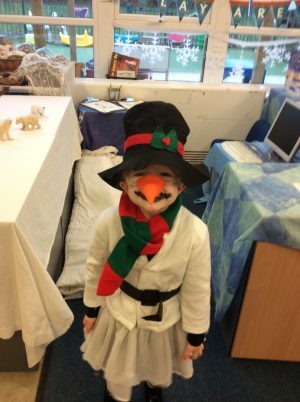 The day started with the classrooms becoming icy and cold with tinsel, glitter and a blanket of white. 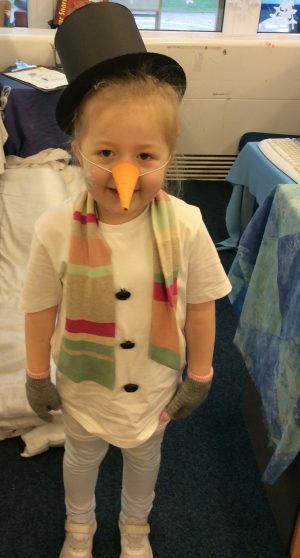 We danced in the hall to “Walking in the Air” and then enjoyed a variety of wintery activities. We ended the day with a warm cup of Hot Chocolate to help us thaw from frosty snowmen to giggling children once more. Everyone enjoyed the day, and the costumes were amazing. We made marshmallow snowmen. It was sticky and gooey. 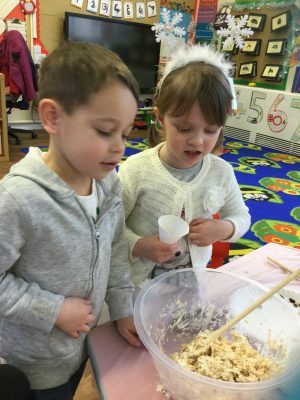 We used rolled the marshmallow rice Krispies into balls. 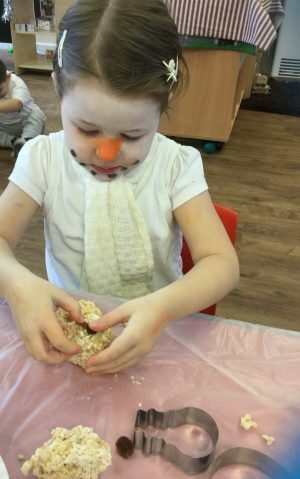 Then added raisins for eyes and buttons. 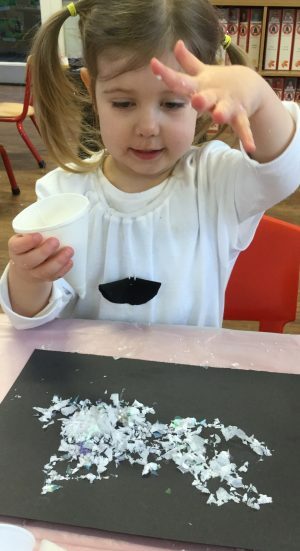 Using glue and icy sprinkles to make a spikey “Jack Frost” picture. 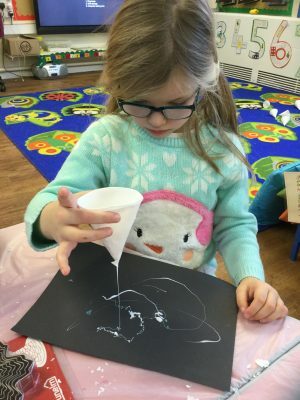 Carefully drizzling the glue to make spikey shapes for a “Jack Frost” picture. 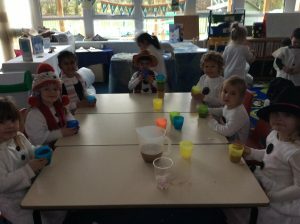 Hot Chocolate and Marshmallows- To Warm us up after a cold and Frosty Day!! !